Finally, after much huffing and puffing, bonfires and green bin collections, we reclaimed the back end of the garden. The overgrown and out of control shrubs and trees are gone, and we got to move the chainlink fence back to the true boundary. It’s taken a year, but felt like a real milestone. Like all clearance jobs, they’re knackering and require graft but provide great satisfaction. Compared to where we started the space is like a new garden, the openness making it feel much bigger. There are still some roots that need removing, but I’ve got over excited and decided to put another raised bed in instead and tackle what’s left later on. However, after putting one bed neatly in front of the greenhouse, I’ve been faffing a lot about where the others are going to go. 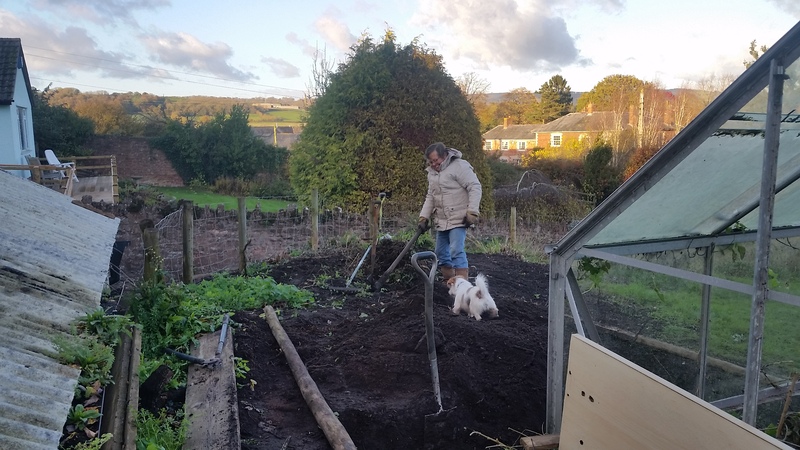 The plan has loosely been to have veg beds and the greenhouse on one side, with a seating area for meals and general plot grazing the other. My problem is aesthetics. I’ve been worrying about having too big a bed next to the greenhouse, so that it dominates the space, but I’ve also been fretting about not having enough space to grow as much as I might want. I was considering a big 10ft x 10ft bed with a space down the middle, but having marked it out I couldn’t help think that it would take over and look too much, so I’m plumping for a smaller 10ft x 6ft bed parallel to the greenhouse. That’s 40 square foot less growing space than I could have had, but after thinking long and hard I decided that this isn’t the time in life for self sufficiency. With two little ‘uns, it’s about enjoying growing vegetables and harvesting some choice treats for the table. Growing the stuff I love, making efficient use of my time and putting focused efforts into productive yields. And after eyeing it up some more this weekend, I’m happy that a smaller bed will just look better too: in line with everything else, rather than one behemoth bed sticking out like a sore thumb. That will still give me as much space as I had in my previous garden, plus a bigger greenhouse. I’m planning on semi screening the veg patch from the seating area with a row of blackberry plants, and if there’s room, another of Autumn raspberries. Two back to back compost bins will go in between the smaller raised bed and the fence, and I’m hoping to put a small tool shed behind the greenhouse. Eventually the fence will be replaced too, with something rather more attractive to screen out the neighbours garage and the other houses around. We’ll stagger it down in size so we still get some privacy but don’t spoil the view. Here’s mum hard at work with the help of Charlie. There is so much soil to shift, but on the plus side it is truly beautiful and so light. The soil is a joy to turn, with no more backache from shovelling thick old Essex clay. However, I cannot confirm whether I will be saying that after the umpteemth barrow load is moved from one side of the garden to another!